This is Ian Alexander, who comes to visit us every day. He is about 5 1/2 months old now. He's so funny and such a happy boy. Arexy says that his brothers fight over who is going to hold him or play with him, so it sounds like he's used to non-stop attention at home. He likes to grin and put on a show to tempt me to pick him up. "Look at me! I'm so cute!" It works every time. Here are some examples from last week. Are you going to pick me up? Bubbling — this is what you want to see! I was never good at science, so I'll put this in the simplest terms as I understand the process. Initially when you begin making your batch of sourdough starter, the 'good' and 'bad' bacterias develop at different rates. After the first few days, the 'bad' bacteria seems to be winning the battle and they can make their presence known by a foul odor. I guess that is one of the points where I used to give up in the past. Developing a strong, healthy starter takes a minimum of a week but two weeks of fermentation at room temperature is probably necessary for the best flavor. The looks that I and my little science experiment got from Arexy and El Jefe were priceless. Arexy only allowed herself the doubting 'raised eyebrow' looks, but El Jefe was more vocal, with comments such as "You're stinking up the whole house with that crap!" and "How long are you going to be doing that?!" It's true, the starter went through a couple of days of really smelling bad! I wasn't 100% confident in my experiment, but I tried to convince him that it would be worth it in the long run. Looks like it came from a bakery, doesn't it? One thing that I really missed when I first came to Honduras was good, chewy bread so I've made most of our bread since we moved here. I'm sure Hondurans feel the same way about homemade tortillas when they move to another country. One of my favorite breads comes from a King Arthur Flour recipe for a rustic artisan bread, but since it requires planning in advance to make a 'poolish' the day before, I found that I had gotten into a rut making an easy Italian loaf. It was good, but not spectacular. I've experimented with trying to make sourdough starter over the years back in the US and here in Honduras. I always gave up and ended up throwing it out because it looked or smelled so nasty that I was afraid to use it. After doing a lot of online research, I finally found a starter recipe that worked for me! I have been making real sourdough bread for a couple of months now and it is so far above and beyond regular bread that there is no comparison. El Jefe is crazy over it, too. Sourdough bread has a crispy, crunchy crust and soft, but chewy interior like no other. Collared Aracaris of the Toucan family are very family oriented birds. Wikipedia says this: "They are fed by both parents, assisted by up to three other adults, probably from a previous brood, and fledge after about 6 weeks, with feeding by the adults continuing for several weeks after leaving the nest. 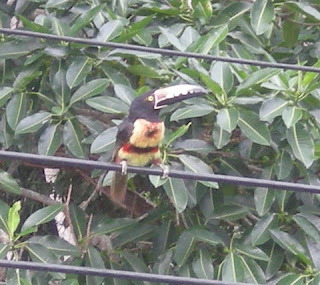 The Aracaris are unusual for toucans in that they roost socially throughout the year, up to six adults and fledged young sleeping in the same hole with tails folded over their backs." 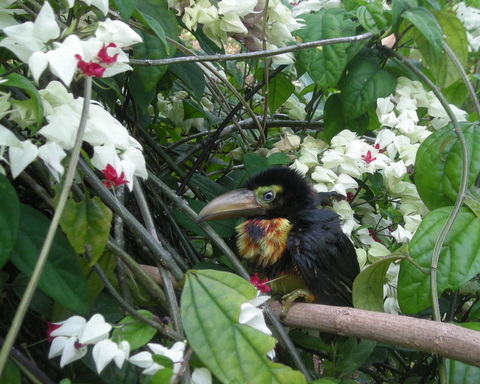 Please read the previous article (The rest of the Touky story) for the background, but while we were caring for an injured baby Aracari, his family returned just about daily for weeks to check on him. Sometimes only one or two would come but often three or four would visit. They seemed frantic to get their "Touky" back and squawked like you wouldn't believe. 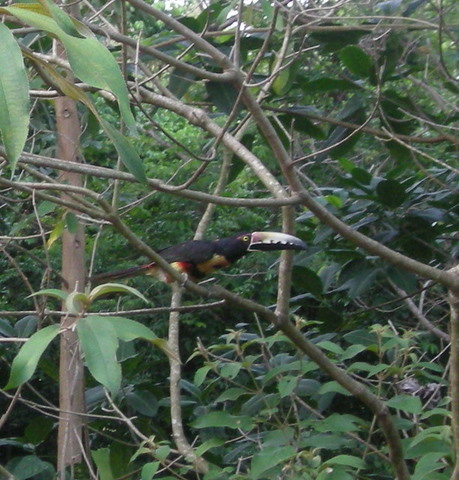 Toucans are definitely not song birds, that's for sure! Occasionally, they would miss a day, but not often and it may have just been that they were here but more quiet than usual and I didn't notice them. It was really heart warming to see. On June 22, 2009, I wrote about Touky the Toucan (actually a collared Aracari, Pteroglossus torquatus) that we rescued. 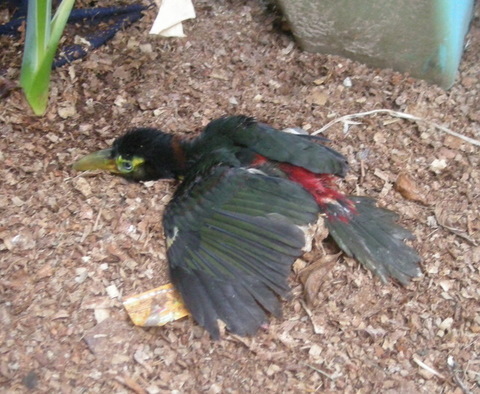 He was a young bird that El Jefe found in the driveway with a broken leg. On June 26, 2009, I commented here that it didn't seem that his leg was going to heal properly and he couldn't fly. I had a ton of photos to show readers that I just hadn't had a chance to put together and upload. On June 28, 2009, the you-know-what hit the fan, and that was the last you heard of Touky. 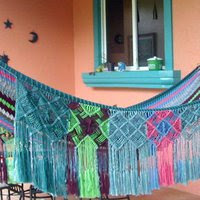 So, here we are in April 2011 — and after even more procrastination, June 2012! It's berry season on my Conostegia xalapensis trees (more on this berry tree here) and we had a family of Aracaris in the trees this morning which reminded me to finish the Touky story. El Jefe found the young bird outside the garage and brought him to me. His foot and ankle were badly twisted. He fearlessly grabbed my finger with his good foot to perch but his other leg just hung loose. My neighbor said that I should get a cage and just keep him but I was totally against that idea. My goal was to get him back to the wild before his family forgot about him. I don't have any bird experience except for my chickens — remember that I did save Pancho the Rooster's life, though he is an ungrateful little devil who shows no appreciation whatsoever. But I have read a lot about caring for chickens and remembered reading of using Popsicle sticks as braces to hold the leg steady until the bone heals so I thought I would give it a try on Touky. Here is a photo of my doctoring work. Initially, I put him in a dog cage but he was so small that he kept getting out between the bars to hop around on one foot. I would find the chihuahuas sneaking up behind him to sniff him. All the dogs were very curious about him and he was very curious about them and the chickens. Touky had no fear whatsoever of people or animals even though he was completely helpless. He could barely hop on one leg without tipping over and couldn't fly at all. I made it very clear to the dogs that he was My Bird and to leave him alone. Thankfully, for once, they listened to me. My kind neighbor then lent me a bird cage. 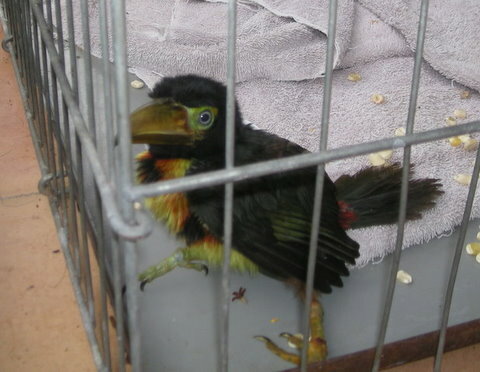 At first I kept him in the cage on a table on the terraza to keep him safe from dogs and chickens and roosters. 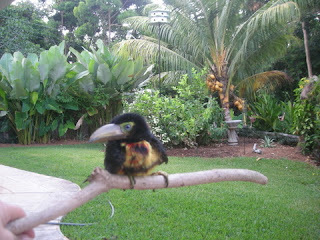 It was guava season and I fed him guavas from our tree, as well as papaya and other fruit. He ate more than his weight in fruit each day. Since he couldn't perch, I made a little nest in a plastic bowl filled with wood shavings to help support him at night (he would literally tip over with only that big beak to break his fall) and to help soak up some of that fruit on the way out. Toucans are very family oriented birds. Amazingly, his family came to check on him every single day. They would frantically squawk and he would squawk back. They seemed so distressed so I started putting the cage out in the yard in the shade so they could see and talk to each other — which they did every afternoon and sometimes a couple of times a day when the family would come to visit. The photo above is one day during visiting hours. More photos of the family coming up in another article. 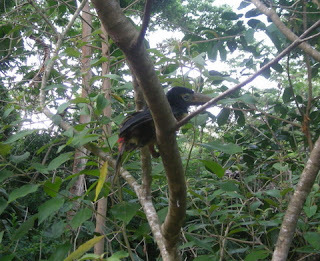 As his leg got a little stronger, I started him practicing perching on a stick. After he got the hang of that, I would put him and the stick in a bush or tree. He sometimes fell out and hobbled away so I'd have to search for him. After a couple of weeks, he started to try to fly but without much success. He would make it a few feet and end up in a 3-point landing: beak and both wings. The dogs would run after him to see if he was okay. 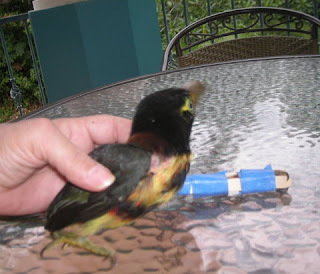 Until his "cast" was removed and he was able perch without me placing his twisted foot around the stick, flying wasn't a great idea. My worst nightmare was that he would fly outside our wall and then find himself helpless with no one to protect him. Though his foot seemed to be getting a little stronger, apparently the brace was not going to straighten it out. I didn't want him to get used to the cage, so during the day I would leave the cage door open so he could hobble out when he felt like it, which he often did. Our Conostegia trees had berries, so to keep him in practice of feeding himself, I would take him to the tree, stand on something so we could reach, and hold a branch of berries down to him to let him pick his own while he was perched on my other hand. 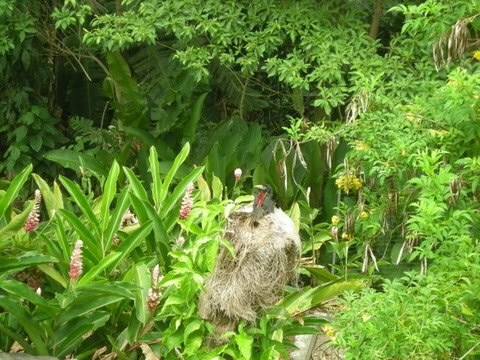 We would also put him in the guava tree so he could peck at his own fruit. His family would land in the tree and squawk at him to come with them. "I can't! I can't!" he would cry. Gradually we gave him more and more freedom. Some days when the news was hot and I was busy, I would forget to go outside to get him to put away in the cage in the late afternoon. He would squawk loudly when the sun started going down to remind me. One day when I went to get Touky to put him away for the night, I couldn't find him anywhere. "I can't find Touky! Where's Touky?! What happened to him?!" I was sure that El Jefe was going to tell me that Chloe the Rottweiler had eaten him or that the chickens had ganged up and attacked him or something equally gruesome. J told me that he flew away. "How do you know?" I asked suspiciously. "Well, I put him in the guava tree and his family came for him. He flew away with them." There was just something about the look on his face.... I had an idea that he was trying to protect me from something, but I didn't press it any further. I just hoped that it was true. I was worried that Touky's leg wasn't strong enough so that he could take care of himself. A few times over the months, I thought I heard Touky but I could never get a close enough look to know if it was him or not. One morning about 6 months later, I woke up very early for some reason. 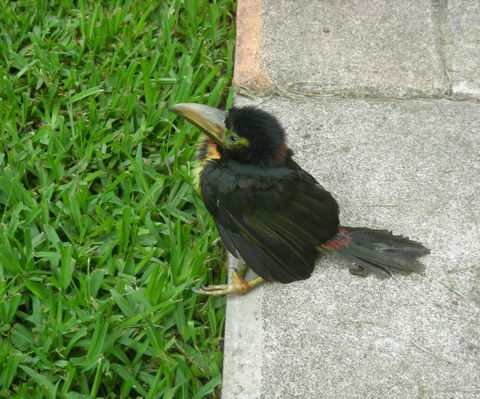 I was walking through the hallway on my way to make a pot of coffee when I glanced toward the terraza and saw a bird standing on the floor outside. Initially I thought it was a bird who had flown into our windows and been stunned. The bird turned and in the dim light, I saw the unmistakable toucan beak. Even more interesting, just then Chloe walked up to the bird and the little bird stood beak to nose with the 75-pound rottweiler without flinching. "TOUKY! Touky, is that you?!" I ran outside and reached down to pick him up. He wasn't afraid at all and didn't try to get away. I said his name again and he squawked at me. I looked at his leg and sure enough: He had that poor twisted foot but he was still able to use it to hang on. It was Touky! I was so excited. I wanted to get a photo and wake up El Jefe to see this miracle. As I was carrying him upstairs — you aren't going to believe this — he laid his head on my chest! He remembered me! I know this must sound too fanciful to believe, but it's true! It happened! I grabbed the camera and took Touky out on the upper terraza where the light was better. But in my fumbling to get him into position on one hand and the camera in the other hand, Touky decided he had had enough of revisiting civilization and flew away so I never captured that photo. 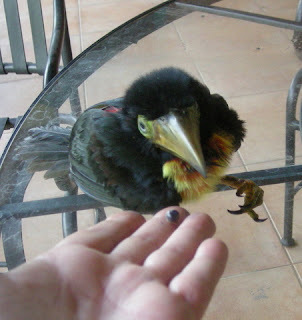 This one is an earlier photo with me feeding him berries. That fuzzy little head made me laugh every time I looked at him. 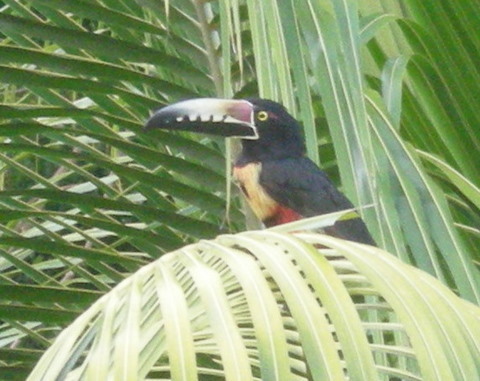 Every time I see or hear the Toucans in my trees, I call out, "Touky? Is that you, Touky?" Mostly they ignore me, but the other day, one perching in the guava tree stared at me for several minutes, turning his head from side to side while I stood in the open window just a few feet away from him, asking, "Touky? Touky?" I couldn't see his foot, so I can't be sure, but I like to think that it was him.